Surly's Ultra New Fix/Free Singlespeed Hubs are new even though they look like the old hubs. The differences are noticeable when you look past the aluminum 6061-T6 forged and machined alumninum shell. Inside the Surly Ultra New Hub is a new hollow axle that very easily converts from a bolt-on to quick release axle. Flip the hubs from the fixed gear side to the freewheel side to suit your riding needs. All Ultra New hubs come with fixing bolts, but all are QR compatible without axle conversion or any other extra stuff. Surly's Ultra New axles are made of Chromoly steel with 10.9 stainless steel fixing bolts. The Surly Ultra New Hubs are offered in different widths for different applications. 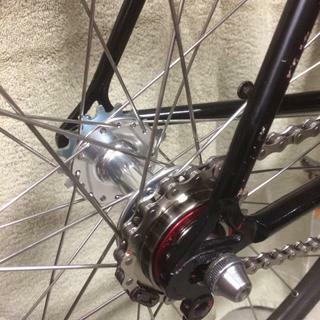 The Surly Ultra New hub in 130mm spacing provided a good chain line when converting my '87 Team Raleigh. As a benefit, I am able to use a QR skewer in these horizontal dropouts. Surly Ultra New fixed/free hub 130mm spacing on horizontal dropouts. Jensons customer service and shipping time are great. Would indeed buy from again. Commuter wheel set for my cross bike. Delivery was fast, service was great! What's the tread on both sides, 1.37" * 24 tpi or 1.375" * 24 tpi?